The Controller by 200 Toy is a third-party Sega Dreamcast controller released in 2000. Unique to this controller is the removal of the traditional analogue stick in favour of an analogue "hemisphere", i.e. a half-spherical piece of plastic which moves more like a trackball. Unlike a trackball, however, this method of control does not rotate a full 360 degrees in all directions, leaving it somewhere in between the aforementioned control schemes (from a technical perspective it moves much the same as the base of an analogue stick). Also offered are two extra and face buttons and some basic turbo features, as well as a variety of colour options. 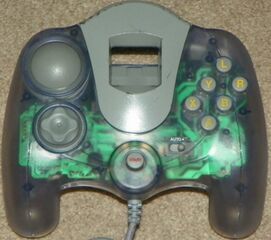 Working versions of these controllers are not common - the substitute for the analogue stick is prone to failure resulting in little or no feedback to the Dreamcast console.